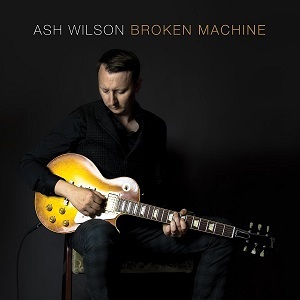 Broken Machine is the debut album from English Blues musician Ash Wilson. He sings and plays guitar while his brother Phil Wilson drums and produced the album. There are some guests on the album too - Bassist Roger Inniss (Chaka Khan, Laurence Jones), keyboard player Bob Fridzema (King King, Dana Fuchs) and guitarist Jesse Davey (The hoax). There's a good mix of styles on the album, with Blues firmly at the core, but Blues is a wide ranging genre and Ash Wilson avoids getting tied down to one sound. The album kicks off with "Show me how to love you", an absolutely superb song with some great guitar playing and a nice southern Blues feel. The vocals too work really well here. From there we move onto "Worlds gone crazy" with a much more upbeat musical sound which contrasts with the more serious lyrics talking about how events are portrayed on TV and the sense of confusion it creates. Another standout track is "The Hitcher". The drums and rhythm guitar are constant throughout, intended to represent driving althought it reminds me more of travelling by train in a remote area with the drums nicely fitting the sounds the train wheels make on the rails. It tells how his girlfriend left him without telling him and moved to London, and with the steady rhythm and the storytellign vocals it's quite hypnotic. The guitar solos from Jesse Davey add some extra interest to what was already a great song.